I'm leaving on a jet plane. Today I start my journey to the Baptist World Congress, held every five years by the Baptist World Alliance. This year the gathering is in Durban, South Africa. I'm looking forward to visiting that country and experiencing some of its culture. I'm also looking forward to seeing Dubai in the United Arab Emirates, which I'll spend a day in both ways as part of my travel. Once in South Africa, I'll catch up with my Baptist friends - and make some new ones - from around the world. Baptists from more than 80 countries will attend the time of worship, fellowship, ministry, and dialogue. The BWA is a great organization, and I've enjoyed previous (smaller leadership) meetings in Jamaica and Turkey. I'll also be involved with several efforts during the Congress. I will speak on a panel on "Church and Technology" along with fellow Ethics Daily guys Robert Parham and Cliff Vaughn. I'll attend committee meetings (I've been on the Communications Advisory Committee since 2010 and will be joining the Awards Committee and the Commission on Christian Ethics). I'll also report on the meeting for Ethics Daily and Churchnet. Parham previewed Ethics Daily's coverage in a column this week. 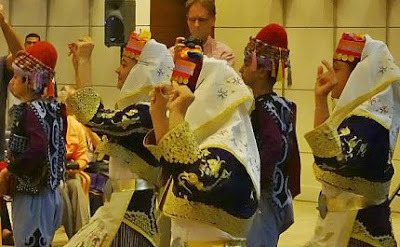 He noted the role I'll play (and a photo I took of dancers at last year's BWA meeting in Turkey accompanied the column). It should be a busy but fun week!